Organic Umami Savory seeds perfected for indoor growing. 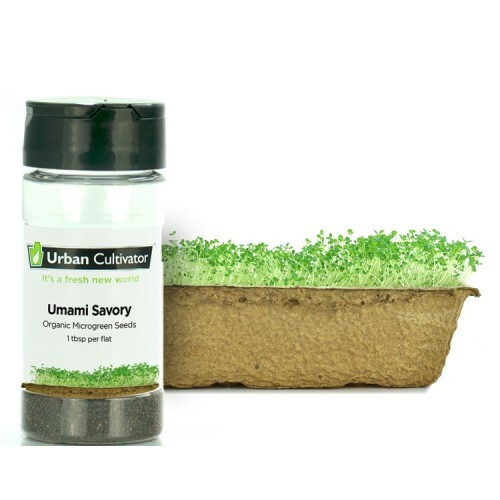 Grows four flats of Umami Savory microgreens. The leaves of savory have somewhat peppery flavor with a minty thyme undertone. Summer savory is sweeter and lighter than winter savory. Both types of savory are used in the same way—they are the traditional flavoring for broad beans and lentil soup. Summer savory will enhance fish, vegetables, cheese and eggs, pea soups, beans and many other dishes. Tomatoes have a particular affinity for savory so you might try slipping a bit into your next tomato sauce. Summer savory combines well with other herbs, bringing out each flavor without overwhelming.